Speaker Paul Ryan, R-Wis., departs after taking questions from reporters about a closed-door GOP meeting on immigration Thursday. 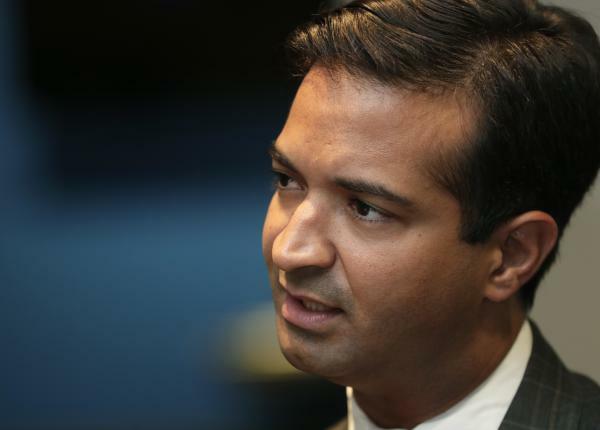 Rep. Carlos Curbelo, R-Fla., represents a district where 70 percent of his constituents are Hispanic and nearly half are foreign born. The meeting concluded with little tangible progress toward a final bill, but Speaker Paul Ryan told reporters there was agreement within the House GOP that they would continue to work on a bill that addressed "four pillars" of immigration policy outlined earlier this year by the White House. Ryan said that is "the most optimistic, plausible chance of getting [a bill] into law." The four pillars include a path to citizenship for undocumented immigrants brought to the U.S. as children, commonly known as DREAMers; border security; ending the diversity visa program; and putting new restrictions on laws regarding family-based legal immigration. "What we've all agreed is the four pillars is a really good point to rally around," Ryan said. Legislation to that end failed to pass the Senate earlier this year, so it's unclear how the House strategy would result in a bill that could become a law. "We don't spend our time thinking about votes in the Senate," Ryan said, when asked about such a bill's long-term prospects in Congress. In recent weeks, uprisings from the party's conservative and moderate wings forced Republican leaders led by Ryan to agree to turn the floor over to an immigration debate the third week of June, but what the House will vote on remains a mystery. The party is divided over two very different approaches to immigration. Conservatives have been agitating for months for a vote on hard-line immigration legislation authored by House Judiciary Chairman Bob Goodlatte, R-Va. GOP leaders never brought the bill up for a vote because they say it doesn't have the support to pass the House. House Freedom Caucus Chairman Mark Meadows, R-N.C., said his group of conservatives wants to ensure the House votes on something similar to the Goodlatte bill that adheres to the White House framework. "What I envision the leadership doing is taking all of the feedback and crafting something," Meadows told reporters after the meeting. "What it comes down to is the citizenship question and how you deal with that." GOP leaders strongly oppose the discharge petition, but signatures keep getting added to it. As of Thursday morning, supporters were just three votes shy of the 218 they need. 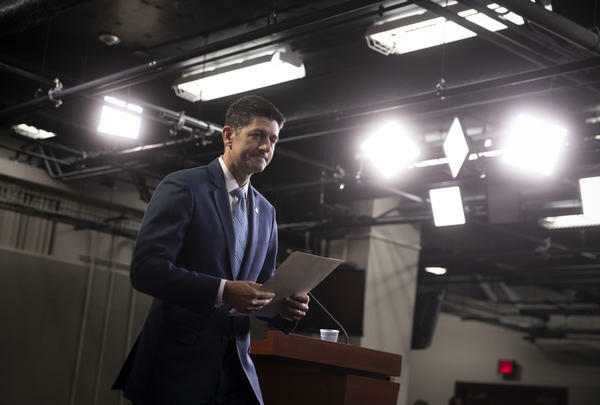 Ryan said he was confident Thursday's meeting put the brakes on the petition effort as Republicans work toward legislative compromise. He said Republicans are working to "exhaust possibilities" to avoid a discharge petition, but he did not rule out that it could still happen. "Obviously, time is of the essence," he said. Retiring Rep. Joe Barton, R-Texas, has not signed the petition, but he warned that the effort to gather signatures is on a fast track, a process that will only speed up if leadership fails to produce a bill. "If we don't agree pretty quickly you'll get two or three more signatures on the discharge petition and one of those four bills will go to the Senate and it will probably be one of the more liberal bills," Barton told reporters. "I would vote for that because I think some solution is better than no solution. But I'm one of 20 or 30 Republicans who would." A moderate solution could pass only if a majority of Democrats signed on to the bill. That could potentially pass the Senate, but only if Senate Majority Leader Mitch McConnell, R-Ky., agrees to allow it to come up for a vote. And that will happen only if Trump gives a clear signal that he will sign whatever the Senate passes. It is a complex bind that makes it highly unlikely that any immigration bill will become law as the result of these negotiations. But many supporters of the moderate bill say the emphasis on a hard-line partisan immigration solution is shortsighted. "Things that become law and stay law are bipartisan," Barton said. "It's one thing to get a partisan bill through the House and maybe even get it through the Senate and maybe even get the president to sign it. But if it isn't bipartisan then you have another Obamacare debacle." Last month, conservatives voted down a farm bill they support on the floor as a leverage play on immigration to counter the moderates' discharge petition strategy. The farm bill now can't pass until the immigration debate is resolved. Adding to the internal drama is the pressure on party leaders to negotiate a way out of this dispute that doesn't prompt a further rebellion in the ranks. Ryan, who is not running for re-election, has been dogged by speculation since his announcement that he might need to resign early. He wants to remain speaker through the remainder of this Congress. His top two deputies, Majority Leader Kevin McCarthy, R-Calif., and Majority Whip Steve Scalise, R-La., are angling for leadership promotions in the next Congress. How the trio navigates this immigration debate is being closely watched for what it could mean for their own political futures. When asked if his lame-duck status has made it harder to negotiate with his rank and file, Ryan said no. "I don't think that's it at all," he said, adding that immigration is a "difficult issue" for his party and they are working to find the "sweet spot." The question of how to address immigration continues to twist the Republican Party into knots. GOP House members spent hours in a basement meeting room in the Capitol today trying to avert a rebellion from within their ranks. Elsewhere on the program, we hear from two of those lawmakers. And joining us now to sort out what is happening is NPR congressional reporter Kelsey Snell. Hi, Kelsey. SHAPIRO: So what happened today? And are they any closer to actually having a deal? SNELL: It kind of depends on who you ask. It was kind of a long day up here on the Hill where everybody was waiting and negotiating, and we didn't really get a ton of real answers. House Republicans had what House Speaker Paul Ryan likes to call a family conversation. They are trying very hard to get a Republican-only immigration deal that they could pass with 218 Republicans and no Democrats. Now, that means getting conservatives to agree with moderates. And it seems like the group of moderates that we've been talking about that are trying to go around Ryan to force immigration votes are going to back down from their big plan for what we're calling discharge petition, the petition to force those votes - that they're only going to wait for a couple of days. And none of what they're talking about is in writing, so right now it's just kind of a war of competing talking points. SHAPIRO: Tell us the specific points of disagreement. What are these different groups proposing? SNELL: Yeah, the fight right now comes down to citizenship and a system that would require all employers to check the citizenship of their employees. People may have heard it called E-Verify. It's a federal database that already exists but is pretty controversial because it would force everybody to use it. Now, again, those are familiar issues. And it's - we've heard them in many, many conversations about immigration since 2013. And actually, for as long as 30 years, they are trying to figure out whether or not they want a specific and different pathway to citizenship for DREAMers or for other people who are here in the country illegally after being brought here as children. SHAPIRO: Kelsey, how are Republicans still so divided over this? It was central to the presidential campaign two years ago. Republicans have promised to resolve this for years. How is this still dividing the party so deeply? SNELL: Yeah. And we heard earlier in those interviews with Congressman Dave Brat of Virginia and Jeff Denham of California when you spoke to them earlier that they agree in the general concept - that they want secure borders, they want a solution for DREAMers. But they can't agree on that citizenship issue. It's really difficult for them. And there are a couple of things to blame here. One is that Denham represents a state that's home to the biggest population of DREAMers in the country. The other thing is that the Republican Party's just really polarized right now. That's partially because there are partisan district lines in some states. And there are some people like Brat who genuinely were elected by voters primarily who are further to the right. And they're more likely to be in line with Trump on immigration. Denham is one of a shrinking number of Republicans who represent areas where there's a mix of voters - of voters of different races and genders and just different perspectives. And Democrats are saying that, you know, he just doesn't represent them, that the Republican Party just doesn't represent that kind of view anymore. And that's part of why he is at real risk of losing his race in November. SHAPIRO: It seems doubtful that anything that passed Congress could actually get the president's signature. So is this all symbolic? What's the point of all of this? SNELL: That's exactly right. And it's exactly the question that I asked more than half a dozen Republicans today. And I didn't get a clear answer other than the fact that this is politics. These guys haven't voted on immigration. They need to go back to voters and at least say that they tried. It also could send a message to President Trump about what can pass in Congress. And that could impact what he's willing to support in the future because if you think about it, this is part of a longer conversation. They don't have to do immigration this year. SHAPIRO: NPR congressional reporter Kelsey Snell, thank you.